So I guess I better put it out there: after all my hoping and all signs pointing in my direction, I won’t be on the Great British Bake Off this year. And now that that’s out of the way, it’s time to continue in my pajama-clad adventures! 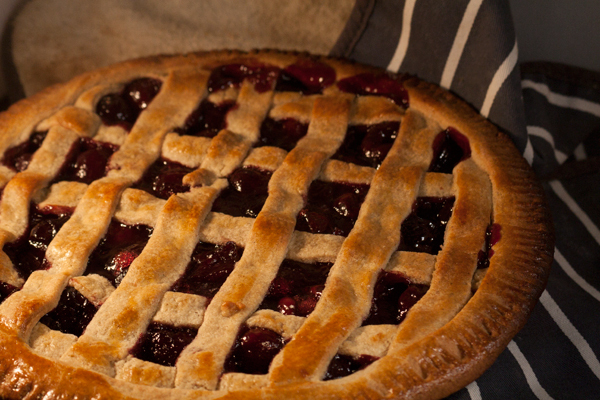 This week I decided to make a cherry pie with a latticed top. I originally found the recipe in a cookbook my friend Leslie gave me for Christmas, but it called for cherry brandy. Having none on hand I instead substituted a bit of Coke, which I think tasted pretty awesome. I also love the addition of the allspice to the pastry – it makes for an extra tasty flaky pie crust. I’ll admit, the lattice is a little tricky to do – the key is to make sure your dough is good and chilled so that it doesn’t want to fall apart when you go to create the top. Best served warm with a scoop of ice cream on top, this pie is sure to cheer you up when you slice into it and see that there’s not a soggy bottom in sight! 1. First make your pastry; sift together the flour, baking powder, and allspice into a large bowl. Then stir in the salt and sugar and mix well. Rub in the butter until the mixture looks like fine bread crumbs. Make a well in the center, power in the eggs and mix into the dough until it comes together. If you need to, add a tiny bit of ice cold water to help. Once it comes together, divide your dough into two halves, wrap and chill in the fridge for 30 minutes to an hour. 2. While your dough is chilling, make your cherry filling. Put half of the cherries into a saucepan over medium heat. Add in all of the sugar, then bring to a simmer. Once simmering, stir in the almond extract, Coke, and allspice. 3. In a small bowl, mix together the cornstarch and water until it makes a paste. Stir the paste into your saucepan with the cherries and boil until the mixture thickens. Stir in the remaining cherries and remove from the heat. 4. Preheat your oven to 425°F (220°C). Roll out your dough balls on a lightly floured surface until they’re large enough to cover your pie plate. Use one of them to line the pie plate. 4. 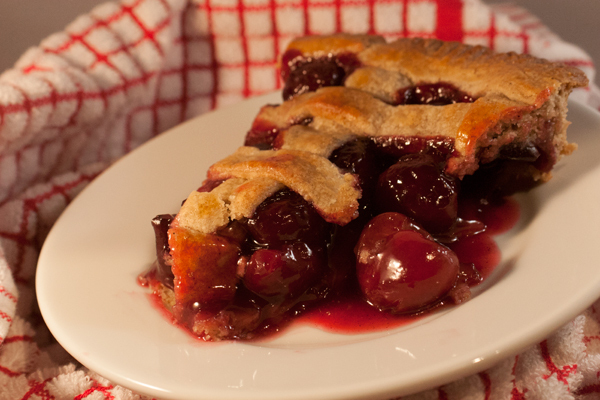 Pour your cherry filling over the lined pie plate, then dot with the melted butter. Cut the remaining dough into strips that are about 1/2-inch wide, then lay them over the top of the pie filling, creating a lattice. Trim and seal the edges with a bit of water and crimp around the outside edge. Brush the top of the pastry with the last beaten egg – this will help give it a golden shine on the top. 5. Cover the pie with aluminum foil, then bake for 30 minutes. Remove the foil, then bake for an additional 15 minutes or until the top is golden. Allow the pie to cool for at least 20 minutes before cutting into it.